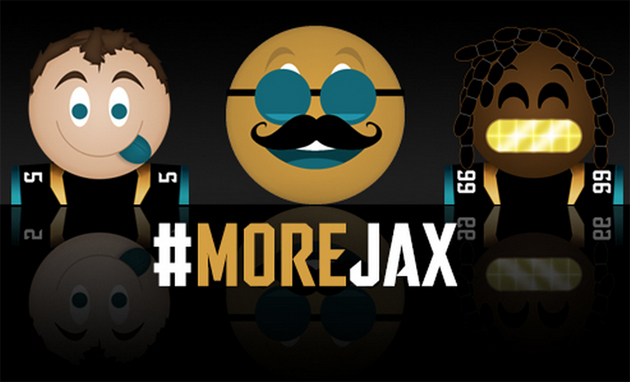 The Jacksonville Jaguars have created an emoji keyboard app for their fans. Sometimes you're watching a football game and there aren't enough words or symbols to express your emotions about the Jacksonville Jaguars. We now have an app for that. The Jaguars launched an emoji keyboard Wednesday that can be downloaded as part of an app developed by the team. The keyboard is pretty exhaustive, with emojis ranging from owner Shad Khan and coach Gus Bradley to quarterback Blake Bortles. The keyboard, the first of its kind for an NFL team, also features stickers and GIFs. Emoji keyboards have yet to become mainstream amongst professional sports teams. The NBA's Atlanta Hawks are the only other franchise to currently have their own downloadable keyboard. The Jaguars, with last year's giant scoreboard and this year's focus on the second screen, seem committed to diverting their fans' attention from the field, where the team has won only 14 games the past four seasons.